There are several eras in New York for which I consistently have the sinking feeling, "I missed out on this. I should have been there!" Damn late-eighties birthdays. I've written about my penchant for 1970s New York before, but another that constantly makes me shake my fists toward the sky in frustration is the drag club scene of the '80s and '90s, specifically that out of which the divine Ms. RuPaul, Lady Bunny, and infinite others arose. "Noooooo!" I think to myself whenever I see pictures of them pre-fame at the Pyramid Club. "I SHOULD HAVE BEEN THERE WITH YOU!!!" Since that is not humanly possible, as of this writing anyway, the next best thing is to immerse myself in a world of photographs where at the very least it feels like I'm there. This has been made possible by the fantastic Linda Simpson, who has been doing drag in New York, and documenting her travels along the way, since the late eighties. She has been called "A worldly wit… A kind of mother superior of the New York drag scene," by The New York Times and "The thinking woman's drag queen," by Paper Magazine, and has made countless national television appearances. She currently hosts drag bingo and performs all over New York and surrounding areas. I had the pleasure of interviewing Linda for the website FeatureShoot.com about some images in the series, those taken of her friend Page in the downtown clubs, and found at my fingertips an entire world Linda had documented in a live presentation she called The Drag Explosion. When could I go?? Well, the truth is there are several times I could have gone, but things like Fashion Week and traveling kept getting in the way. Finally, though, last weekend, I was able to see the final cut of Linda's slideshow--she has been workshopping and reworking the stories she tells and pictures she shows for a while--at The Wild Project, an arts space in the East Village (195 3rd Street between Avenue A and B). It was a perfect venue: not only is it dedicated to developing an inspired community around arts, it's also not too far from where many of the images where taken, the Pyramid Club at 101 Avenue A at 7th Street, which is the venue that first brought drag into the spotlight during the time. I brought TDS with me, who was visiting from Philly, and we found ourselves a fabulous pair of seats in the center of the theatre. We were two of a few ladies in the audience, surrounded by men--many of whom, we'd discover, had either been there the nights the photographs were taken, were in the photographs themselves, or knew so many people in the photographs they'd clap and giggle with delight upon seeing them, happy little gasps emerging from their lips. It's like seeing a slideshow of photographs of your parents before they got married--everyone has a story about what they're seeing, and you want to hear all of them to learn everything you can about what their life was like before you existed. All of Linda's photographs, snapped with a simple point-and-shoot camera, capture the bright, bold colors of unbelievable glamour--faces painted stark white, bodysuits in electric purple, colorful eyelashes spilling forth onto faces, bold red lips, bright green eyeshadow and any other color in the rainbow you could possibly imagine plastered onto a human being. It's like my childhood fantasy coloring book exploded onto the screen (I know I've mentioned several times how I was raised on drag, so please forgive me for saying it again. But in case you'd like to remind yourself, here is an essay I wrote about it a few years ago), and was punctuated with stories I could appreciate as an adult. Wild nights at the Pyramid and other nightclubs (and their bathrooms) like Limelight and Palladium, the rough East Village pre-Giuliani, an affordable apartment on 13th Street. The slideshow documents Linda's first forays into drag in New York, all the way through the end of the first spotlighted drag era in the late 1990s. When presenting The Drag Explosion, Linda also invites active scene performers from the time to tell stories about different photographs in which they appear. The evening I attended, Michael Formika Jones, previously known as Mistress Formika, was Linda's guest. He told wild stories about the fabulous, inventive Jackie 60 parties, his Wigstock performance on the Christopher Street piers, and so much more. I felt like I was there, but was also horribly envious that I wasn't. It was perfect. 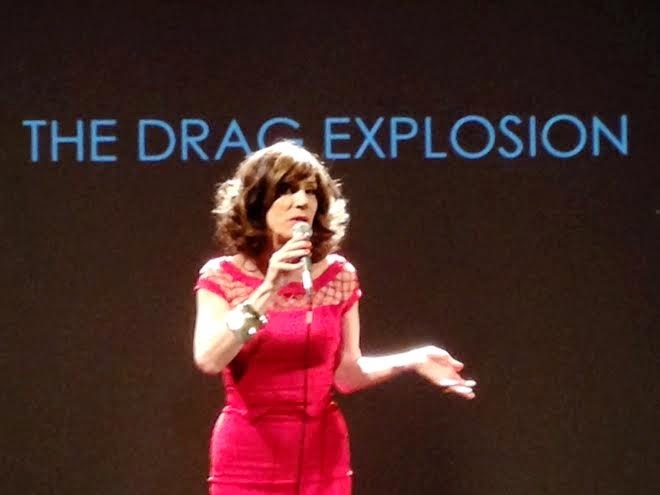 If you're interested in a night of wonderful drag history and images, I urge you to check out Linda's Drag Explosion! Check here to see where you can find it next. That is, if you think you can handle the fabulousness.